� to expand the cause of gun rights and liberty advocacy by producing a much larger number of letters being submitted for publication to mainstream media outlets. We receive letters written to legislators and other public officials, editors of newspapers and other publications and publish them in a cohesive archive for later use by the people who read this website. � Good writers deserve to be heard. � Good letters can be reused, especially by those who don't enjoy writing letters but would gladly reuse letters written by others. � Many mainstream media outlets shun pro-gun-rights letters. Increasing the volume of such letters by reusing those published on our site may help change that pattern. � Many people send us great letters, and we finally realized that an intelligent system was in order to make the letters count for more than "today's human interest." � We've had many requests that we do something of this nature -- and here it is. This KeepAndBearArms.com Team is in its early stages of development. Richard Beamis is the Director, and he is currently seeking an Assistant Director. If you have interest in contributing as a volunteer teammate, please contact Richard. � Before you make contact, please know that the volume of emails we receive is often intimidating. Please make certain that your question is not already answered in our Frequently Asked Questions section or elsewhere on this page. � Please also make sure that any submissions to our Liberty Letters archives fall within Submission Guidelines. � PLEASE DO NOT this email address to ANY distribution lists without express written permission to do so. Thank you! What are the criteria for submitting letters to be published on this website? Read the Submission Guidelines for your answer. How often do you publish letters submitted to your site? As we refine our systems, you will begin to see letters published 5 days a week, sometimes several letters each day. As we are a volunteer team, we reserve the right to take a break from time to time and thank you in advance for your understanding and patience. � Our "Letters to Editors" email address is ONLY for use when copying us on letters you've sent to the editors of other news sources, to legislators, to pro-gun or anti-gun individuals or organizations, etc. This is NOT the place to send feedback about KeepAndBearArms.com. REPEAT: This email address is SOLELY a place to receive pro-RKBA letters that have been sent to others. � We will ONLY print letters that involve the right of the people to keep and bear arms or a closely related subject. � We will ONLY print letters that are edited and ready for publication. That includes spelling (use spell checker), reasonably sensible grammar, paragraphed thought progression, etc. � We reserve the right to edit letters sent to us if we deem it necessary to do so. � We do not guarantee that sending a letter to us means that it will be published. If we print it we print it; if we don't, we don't. � If your letter does not include your full name and email address and the header that shows it was already sent to its original destination, chances are good that it will not be published. If the Founding Fathers of this great nation could sign their name to the Declaration of Independence knowing it would mark them for death, you can sign your name to a letter to the editor. If you disagree, go publish anonymously somewhere else, and drop back by when your backbone matures. � If your letter to an editor is in response to an online article or publication, PLEASE include the website address of that article so others can go read it and write their own letter if so inclined. � PLEASE include the full header of your emailed letter if you sent it through email. Having the date and time you submitted it plus proof that it was actually sent provides online documentation that can and eventually will be used confront editors of other news agencies that refuse to print the gun owner's side of the story. And having the email address to which your letter was sent allows readers to quickly follow your lead. � DO NOT submit your letters in all caps. If you write in all caps, dump the text into a text editor and change it to "sentence case" before sending it. � DO NOT add the "Letters" email address below to any distribution lists, not now or ever. � Pellet Gun Not Dangerous? � "Gun Nuts" and "Gun Control Freaks"
� WA Post: What Happened? � A/C Ignoring Scandal at Emory? � A Politician in Our Back Pocket? � .50 BMG or Box Cutters? 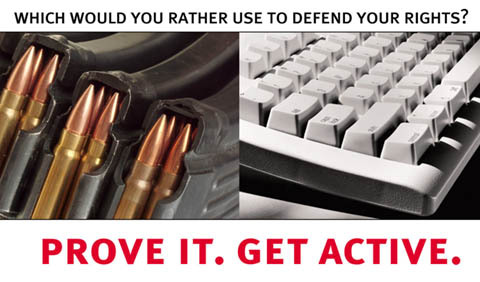 � Defend Our Lives and Property! � Coincidence? I Think NOT! � Brady Bunch Has Attacked Freedom Itself! � Mad Dad Gets Mad! � You Can't Have It! � Are You People Insane? � Daisy, How Can We Help? � What is the Answer? � Ironies of "Cease Fire"